Many of us have journeyed to Spain to play some great courses, enjoy the warm welcome and weather and sample wonderful gastronomy, but there is a region of the country still remains relatively untouched by the travelling golfer. It’s Galicia in the far northwest. 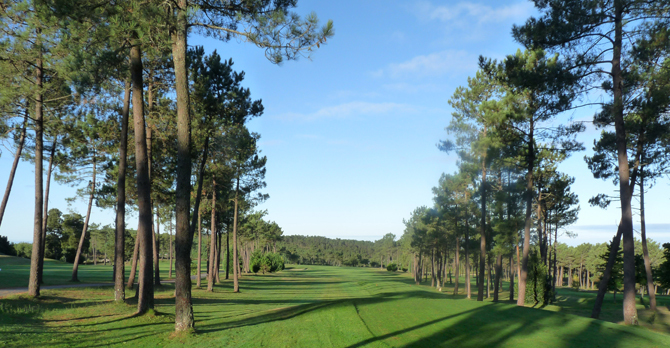 Galicia isn’t your normal golfing destination: rather this is a place where you can combine your love of the sport with a thirst for history as well as indulging in some world-class spas and splendid gastronomy. The white wines, for instance, are some of the best produced anywhere in the world – and I bring you that statement after plenty of keen research! The capital of Galicia is Santiago de Compostela, a UNESCO World Heritage city that simply oozes history. St James the Apostle is buried in its incredible Cathedral that marks the end of the so-called ‘Camino de Santiago’, the Pilgrim’s Way which has been travelled by millions of people from all over the world for centuries. Back to the matter at hand. 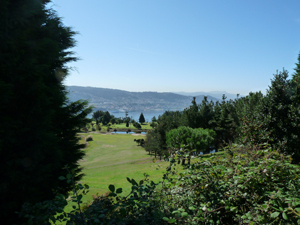 The first course I played was the delightful Mondariz Golf Club, situated about 10 miles from the city of Vigo and part of the Balneario de Mondariz hotel and spa complex. The clubhouse sits above the 9th and 18th greens and offers not only spectacular views but sensational food and wines – so at least you’ll have something else to relish if your game isn’t quite up to scratch. You will really enjoy playing this course. It’s not too long, but strategy plays a big part and you’re made very aware of this on the par-5 third hole. It’s the perfect risk-and-reward hole, a severe dogleg left where you have to decide to either drive over the rocks and risk out of bounds or play safe to the end of the outcrop and play it as a three-shotter. Take it from me, there’s no chance of making the par-5 sixth hole in two shots: a stream at the 300 yard mark catches the longest of drives, and when playing your second shot there are out-of-bounds on the right. The green is built into the back of a ravine with a very narrow entrance. It’s a beautifully-crafted hole using the natural geology. I could wax lyrical at length, but in brief: the finishing holes to each nine are fantastic driving holes; a great risk-and-reward at the par-4 fourteenth where you can go for the green if you take on the stream; and some fabulously-designed par 3s, especially the second, thirteenth and seventeenth holes. 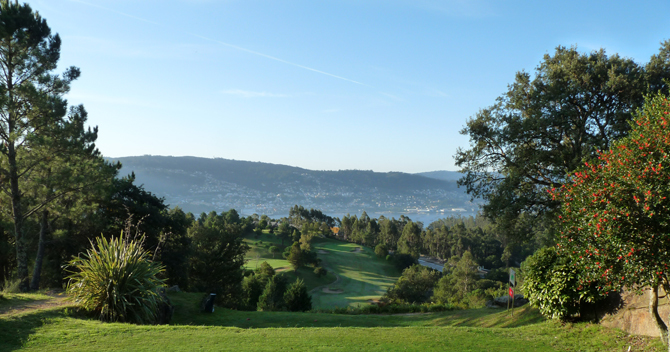 Next up was the Ria de Vigo Golf Club designed by Ramón Espinosa, which sits in the hills above the town of the same name. 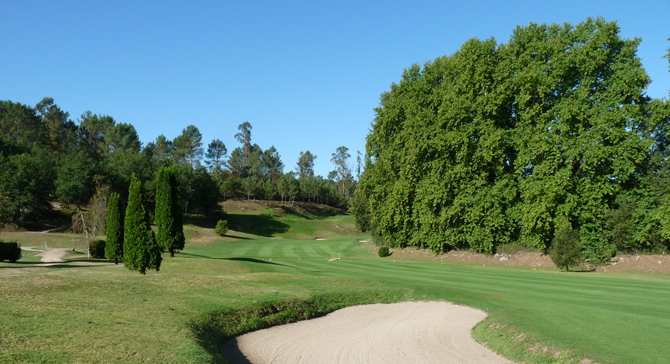 It has one of the best opening holes I’ve ever played – more for the views and design than its difficulty – and the course is set in some of the best countryside in Galicia, offers some amazing views across the river to the city of Vigo. The potential here is blinding: if this course could attract funding for some much-needed shaping, manicuring and reseeding, this could become one of the best courses in the region, with views arguably unrivalled anywhere in Spain. The 372-yard, dogleg left tenth is a great driving hole from an elevated tee, to a very narrow fairway that is protected by a steep back that goes up on the left and a drop of 30ft down another bank on the right. Perfect! The 350-yard twelfth is an intriguing hole with two options for tackling it: you can play up the right-hand fairway and play it as a dogleg left leaving a medium iron in, or drive over the ravine to the left-hand fairway and have a wedge into a very small narrow green. Like the first, the 549-yard, par-5 fourteenth offers some great views from the tee across to Vigo, but make sure you concentrate here. If you hit a good drive and use the slope to your advantage you can be hitting as little as a 6/7 iron into this very narrow but wide green. 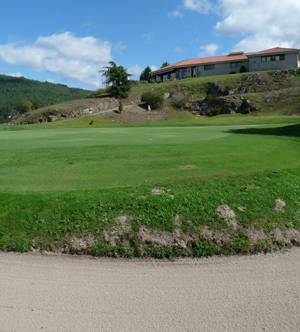 The last course on our tour of Galicia was the Campo De Golf De Meis, another track that has some breathtaking views. Set in a forest of pines, the holes are cut through the trees with glimpses of the Ria de Arosa mountains, which were surrounded in mist upon our arrival just to add a mystical air. There is a new clubhouse where you can relax and enjoy the scenery and maybe take your mind off how narrow some of the fairways are here. The 384-yard, par-4 opening hole eases you in nicely. It’s a dogleg left and if you play to the right of the fairway you’ll have no problem seeing the green. But the second is a monster of a hole: 553-yard, par-5 uphill with a narrow fairway, trees on the right and OB on the left! 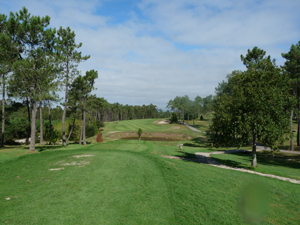 Overall you will enjoy the course – it has some really great driving holes with elevated tees and you can see the fairways, which I always enjoy. There are some well-designed par-3s, two of which come back-to-back at the 9th and 10th holes where water comes into play on the latter. In fact water comes into play on five of the holes on the back nine. If you have a great round, you can toast Saint James the Apostle and soak up those views when you get back to the clubhouse – you will have earned them. Better still, after a fantastic round, go to the cathedral in Santiago and thank him yourself.